AN effort has been launched to trace survivors of hundreds of troops secretly sent to a North-East town after their rescue from Dunkirk in 1940. Details have emerged about battleweary soldiers being put up in a drill hall, a former mill and Co-op building at Barnard Castle until a military base was ready for them. They then became the first occupants of Stainton Camp, and many later took part in war operations in Europe. Eileen O'Hara, who is managing a project to compile its history, said the troop movements were carried out under a strict military news blackout. "Everything was done so secretly at that time that we have been able to discover very little about it," she said. "I haven't come across any official records. "We would love to hear from any of the troops involved, or their families, as it was a really important episode in the life of the camp and the town. "If we don't put some details into writing now, it could be forgotten for ever." More than 338,000 troops were rescued from Dunkirk, in northern France, where they had been trapped by advancing German forces, during a ten day operation - described by Winston Churchill as a miracle. A flotilla of 900 naval and civilian vessels ferried them back to England, but about 5,000 soldiers were killed by German aircraft. Mrs O'Hara said: "With so many men being brought back, they must have needed special billets for them, so it would be natural to send a lot to Barnard Castle. "But we need to hear from the soldiers, or local people who helped them, to find out the full story." The project is being carried out by Stainton Grove Community Association, whose members live in houses close to the camp, which used to be Army married quarters. The camp became a training area later in the war and closed in the Seventies. The houses were handed over to Teesdale District Council by the Ministry of Defence. 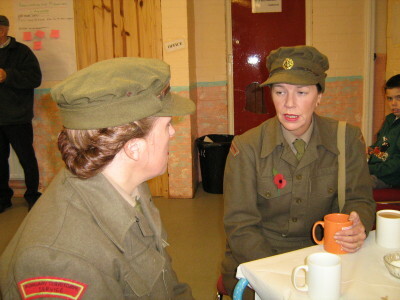 The group is also researching a prisoner of war unit, known as Blackbeck Camp, set up beside the Stainton base. A number of German troops held there were sent to work on local farms. Ullathorne Mill was near the bridge over the Tees but was demolished many years ago. The chimney was brought down in the early 1970s. It was witnessed by a large crowd which included children from Barnard Castle C of E Infants School.